In 1965, at the age of 19, Nat Mokgosi, having completed his schooling, became a member of the Ricky and the Diamonds pop group. The following year he enrolled at the Jubilee Art Centre in Johannesburg for a year. He subsequently spent some time teaching at the Open School in Johannesburg before launching his career as a full-time artist in 1970. Mokgosi has recalled the insistence of Legae on close observation in his life-drawing classes, and his demand that students reflect the dynamic links of tension and equilibrium between the parts of the human body, even when in repose.3 If it was an understanding of form that Mokgosi learned from Legae, then it was Bill Hart who taught him about the expressive power of colour. In his work it took the form on one hand of dramatic light-dark contrasts, or, on the other, of the infinite nuances possible with creative mixing of the primary colours with black and white. The use of the white surface of his support also made possible the generation of subtle luminosities through the application of colour in transparent layers. Elza Miles notes in her recent book, Polly Street: The Story of an Art Centre, that from the late 1950s onwards many Johannesburg artists, Mokgosi included, showed an interest in religious subjects, either as a result of church commissions or as independent expressions.4 Mokgosi’s powerful and dynamic Crucifixion etching of 1971 (plate 217) in the Campbell Smith Collection is one of the latter and is one of his rare ventures into this medium. Religious subjects, particularly those reflecting suffering and redemption, acted as powerful metaphors for expressions of frustration, resistance and hope in the face of the incipient cruelty that lay at the heart of South Africa’s unjust apartheid policies. The ambiguity inherent in some of the animist-inspired imagery in Mokgosi’s work is often inspired by the chance and ambivalent appearances of objects in everyday life. This was an aspect that Legae encouraged his students to take seriously in their study of nature. This Crucifixion etching was, according to a recent interview, generated by Mokgosi’s seeing a pair of worker’s overalls dangling from a tree.5 The resulting etching shows a figure conjoined to Christ’s body, apparently sharing the same pair of legs. This has been confirmed by the artist as his expression of the union between Christ and his followers. This finds theological justification in the Christian notion that all true believers are members of Christ’s body. Elza Miles. 2004. Polly Street: The Story of an Art Centre. The Ampersand Foundation:Johannesburg, p. 141. E.J. De Jager. 1992. Images of Man: Contemporary South African Black Art and Artists. Fort Hare University Press: Alice. Plate 190, p. 164. Miles, Polly Street, p. 141. Born 1946, Newclare, near Sophiatown, Johannesburg. Training 1966: Jubilee Art Centre under Ezrom Legae and Bill Hart. 1975: Studied with Lionel Abrahams. Exhibitions 1970: First solo show at the Michelangelo Gallery, Johannesburg. 1975: Selected by American art critic Clement Greenberg for the exhibition Art in South Africa Today. 1978: Second International Art Fair, Tel Aviv, Israel. Collections Johannesburg Art Gallery, Iziko South African National Gallery, Cape Town; De Beers Centenary Art Gallery, University of Fort Hare; University of KwaZulu-Natal. 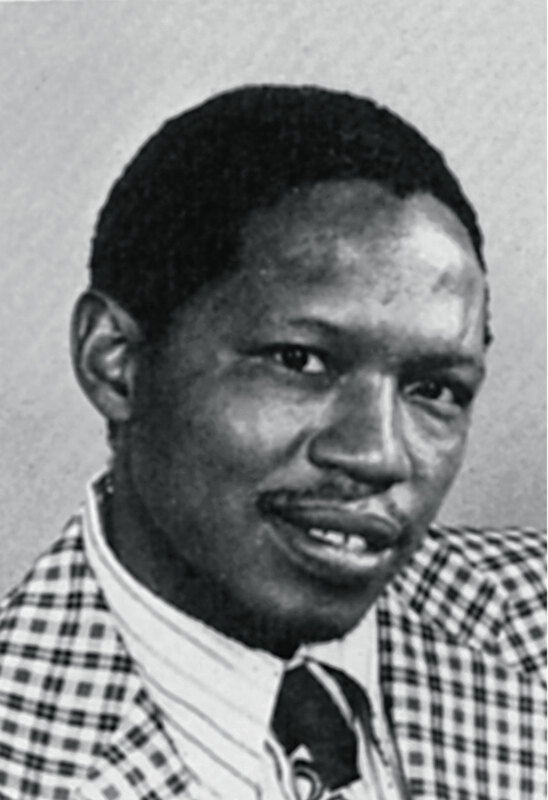 Photograph of Nat Mokgosi. Source: Ricky Burnett (ed.). 1985. Tributaries: A view of Contemporary South African Art. BMW Communication Department, SA. p. 38. When the internationally famous American art critic and theorist Clement Greenberg visited South Africa in 1975, he acted as sole judge-selector for the Art South Africa Today exhibition and selected several works by Nat Mokgosi for inclusion on it. Tito Zungu, Vuminkosi Zulu (qv. ), George Msimang (qv. ), Joseph Ndlovu, Zion Ndlovo, Charles Nkosi, Judus Mahlangu (qv. ), Paul Sibisi (qv. ), Vuyiso Sondlo and Kenneth Thabo were other black artists whose work was also selected. It was thought in those days that a prestigious international name would give credibility to the exhibition, but Greenberg’s choices only stirred up bitter controversy. Many complained of his inclusion of entries that were then disparaged as ‘craft’; and the major prize went to a little-known painter named Christopher Haw. These two drawings Man and Bull (1975) (plate 38) and The Jaguar (1974) (plate 1) are typical of Mokgosi’s work at the time of this exhibition and reflect his ongoing concerns with the relationship between human and animal forms. Greenberg’s writings had been largely concerned with the issues of formalism and abstraction in American painting, so it was not so much the figuration in Mokgosi’s work that might have interested him, as much as the artist’s articulation of his forms on a two-dimensional surface, and his accomodation of his motif to the proportions of his format. These aspects are very evident in these two drawings, where the forms almost touch the peripheries of the paper. Mokgosi worked out his basic composition and forms first in light pencil work, followed by their detailed linear articulation and energetic cross-hatchings or varying density in pen and ink. The final impression of the whole in both drawings is at once very sculptural while at the same time obeying the dictates of the two-dimensional surface of the paper.